The teenage victim had gone into hiding in Grantham in a bid to avoid the gang only to be lured out by a "honey trap" then kidnapped, stabbed and savagely beaten. He was tracked down and tricked into meeting up with a girl who contacted him on Facebook claiming to be interested in him. Today the gang were sentenced at Lincoln Crown Court. Kane Stone, 25, of Meadenvale Road, Parnwell, Peterborough; Adam Couzens, 26, of Bozeat Way, Westwood, Peterborough; Delano McKinsley, 22, of Mountsteven Avenue, Walton, Peterborough; and Mohammed Nazir, 26, of Gladstone Street, Millfield, Peterborough, all admitted conspiracy to kidnap between 11 and 21 September 2016. Stone and Couzens also admitted inflicting grievous bodily harm. Danielle Corrigan ,27, of Cumberland House, St Mary's Court, Peterborough, denied conspiracy to kidnap but was found guilty following a trial. Gordon Aspden, prosecuting, told a jury at Lincoln Crown Court that the victim, who is from Peterborough, had a troubled background and was involved with drugs while still at school. "By mid 2016 he was mixing with an assortment of drug dealers, thieves and n'er do wells all of whom were involved in serious crime. "His daily routine was dominated by drugs. His lifestyle was unstable and chaotic." Mr Aspden said that at the start of September last year the 17 year old became involved in a dispute with some of his kidnappers after being accused of stealing £5,000 worth of drugs. He went into hiding but was tracked down by the men. "They set up what is referred to as a honey trap. "The boy was sent a bogus friends request on Facebook which purported to come from a young woman called Tracey Ann who lived in Grantham. "There was no Tracey Ann. That request had been sent to lure him out into the open." Mr Aspden said the boy was suspicious at first but agreed to meet. Initially he sent his mate who met up with Danielle Corrigan, who purported to be Tracey Ann, and her friend . Within an hour both boys went to the Co-Op store in Dysart Road, Grantham, to meet the women but as they approached realised they had been set up and ran. They were pursued by a number of men and the 17 year old was caught. He was kicked, punched, stabbed and sprayed with cs gas then bundled into the back of a car where a bag was placed over his head. He was handcuffed and had leg cuffs placed around his ankles. 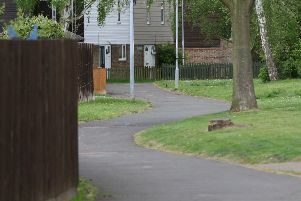 The assault continued on the journey to Peterborough and then while held at a flat at Bader Close in the city he was further assaulted and threatened with being tortured. Mr Aspden said "He was subjected to gratuitous violence. It culminated in a brutal assault during which he was slashed across the face with a knife." The boy was later taken to another safe house and his aunt was contacted with a demand that a £5,000 ransom to be paid for his release. No ransom was paid and the boy was eventually freed from a third address in Peterborough. He subsequently needed 20 stitches in his face and suffered numerous cuts and bruises as well as a stab wound to his right buttock. Judge Simon Hirst, passing sentence, told them "I have no doubt that this was about drug dealing and the victim stealing drugs from Stone and Couzens. "It is aggravated by taking place in broad daylight." The judge said that Stone and Couzens planned in advance what happened. He added "You recruited the other people. Both of you were happy for violence to be used. "The extent of the violence was very significant. Your victim felt he was going to die. He has had to move out of the area because of what happened." Sentence on McKinsley was adjourned to a later date and he was remanded in custody. Alan Stokes ,35, of Bader Close, Peterborough, admitted conspiracy to falsely imprison. Stokes also admitted unconnected charges of attempting to communicate with a child for sexual purposes and breach of a sexual offences prevention order after he was caught in a vigilante "sting" operation contacting what he believed to be a 13 year old girl over the internet. He was jailed for a total of two years and nine months. Amanda Bailey, for Stone, said he is a father of three who comes from a dysfunctional family. She said that during his time in custody Stone has become clean from drugs and there was some hope of him becoming rehabilitated. Mark Watson , for Couzens, said that he had a difficult time during his time in custody on remand. "His father had been very poorly for a protracted period of time. He was unable to see his father properly until he passed away. He attended the funeral hand-cuffed to two prison officers. "In addition at the very start of his time on remand his partner lost their child." Michael Cranmer-Brown, for McKinsley, said his client was only involved in taking the victim from Grantham to Peterborough. He said that the victim was not badly injured when McKinsley departed. "He was not involved in the planning of this. He didn't know what was going to happen to the victim in Peterborough." Claire Howell, for Nazir, said he became involved because he knew Couzens from school. She said Nazir was asked to arrange a taxi to Grantham. "He must have realised what was going on but took the stupid decision to continue. When he got back to Peterborough he didn't phone the police. He now has to bear the consequences of his actions." Barnaby Shaw, for Corrigan, said she believed she got involved because she was in the wrong place on the wrong day. "She chose to have a trial and was convicted. She is not in the best of health. She could not contemplate being separated from her daughter. "She is remorseful for her actions." Karen Walton, for Stokes, said he had allowed his flat to be used by the gang in return for cocaine had not taken part in the torture. She said Stokes has learning difficulties and suffers a number of health problems including epilepsy.